Of all the cities we visited while we lived in Poland, I think that Wrocław is one of the prettiest. Fortunately, my solo road trip in Lower Silesia in 2015 meant that I got to spend some extra time in Wrocław, which is Poland’s fourth largest city. 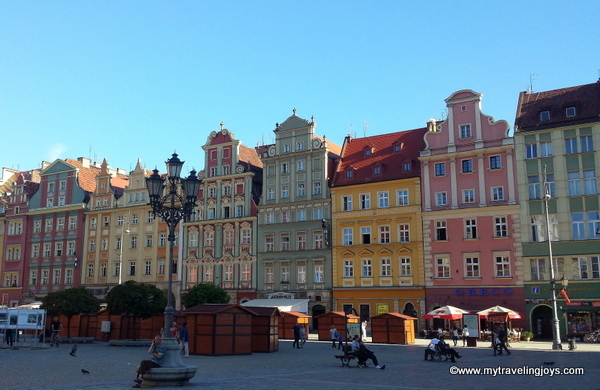 Known under dozens of different names as it was passed repeatedly between four countries (there’s a strong German influence here), Wrocław is an architecturally diverse city, which was largely rebuilt after World War II. Ranging from Gothic to Art Nouveau, I can’t resist the marvelously-restored facades of the townhouses surrounding the Market Square. The square is the city’s heart and the maze of cobbled streets, canals, bridges and church spires seem to spin off from here. The market square and the urban grid around it was designed by city planners all the way back in the 13th century. In the middle of the square, you’ll find a medieval structure known as the Town Hall (Ratusz) which also dates back to the 13th century and (surprisingly) was barely damaged during WWII. There’s a large clock on the front and the interesting architecture makes the building look like it’s been pieced together like a puzzle. Today, Wrocław can be easily reached from most European destinations and is certainly worth exploring for a few days like I did. I’m linking this post to the monthly travel guide link up organized by Fiona, a fellow Australian blogger, at Tiffin Bite Sized Food Adventures. Each month features a new letter of the alphabet. This month is the letter “W.” Please pop on over to Fiona’s blog to read more travel stories or feel free to link up your own! As always Joy, you clearly know more about Poland than I do! And I definitely agree, Wroclaw is one of the prettiest Polish towns with all those narrow streets and brightly-coloured houses. A winter market there (from what I remember) is pretty epic too!